CT Scan Abdomen Cost in Delhi - Pay 50% Lesser! A computerized tomography (CT) or computerized axial tomography (CAT) scan collects data from series of X-rays images captured to produce a detailed image of structures inside the body. It is used to diagnose and detect problems associated with organs like head, heart, lungs, abdomen, kidney, liver, pancreas and more using images of soft tissues and muscles. Symptoms – The patient may be advised CT scan when he has acute abdomen pain, if any mass is felt in the abdomen area, Kidney stones – their size or location, a patient faces sudden weight loss, appendicitis, intestinal obstructions, inflammation in pelvic areas or intestines or any recent cancer diagnosis. Procedure – The patient may be asked not to eat anything 2 – 4 hours before the scan. Clothing is expected to be loose or the patient may be provided with a hospital gown. The patient is required to lie down on the CT scan table. Depending on the reason for the Scan, the patient may be given an oral contrast dye, which will help in giving better images for results. The patient may need to wait 60 – 90 minutes after the contrast is taken. The doctor must be informed prior if the patients has any allergies, is diabetic or if she is pregnant. The circular X-ray emission scanner moves around the abdomen area to capture images of the organs inside the abdomen. This CT captures a cross-sectional “slice” of the abdomen. CT scan of abdomen helps in accurate diagnosis of abdominal diseases. A typical abdomen CT scan may take 10 – 30 minutes. CT scan of an Abdomen is commonly used to investigate acute abdominal pain. It helps the doctors diagnose cancer, as well as helps in follow ups after cancer treatment to assess response. Other than cancer it helps in diagnosis of inflated colon, appendicitis, abnormalities of liver, spleen, pancreas and kidneys. Once the raw images are captured, these images are reformatted in three-dimensions using a computer tomography. These images are then read by the radiologists to draw conclusions and form the results. These results can be then transferred into a CD or a DVD or may be printed as well. Delhi is known for having expensive healthcare facilities and services that are hardly affordable by all the people. This is because there is a lack of healthcare expenditure support and there are many hospitals and scan centers which are short of doctors, trained technicians and equipments as well. The city is also known for the long waiting periods for meeting their healthcare needs; the CT scan in a public hospital has a waiting time of 40 – 45 days. Most of the private scan centers in Delhi are equipped with 16 to 64 slices scanners. The cost of a whole body CT scan may cost you around INR 15,000. Whereas, an abdomen CT scan with pelvis may cost you approximately INR 3,000 to 4,000. The cost may vary if the scan is with contrast. Delhi has a very crumbling healthcare system. The Delhi Government recently announced that residents can avail free CT and MRI scan at few scan centers in Delhi with a referral letter from the listed 30 government hospitals and 23 polyclinics. But this still does not rule out the waiting time difficulty people face. 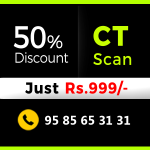 To bridge this gap, BookMyScans helps the residents of Delhi to avail the CT scan facilities at the best quality and accredited scan centers at assured 50% discount. BookMyScans.com has partners around centers in areas like Kirtinagar, greater Kailash and more who are AERB (Atomic Energy Regulatory Board) approved and ISO (International Organization for Standardization) and NABL (National Accreditation Board for Testing and Calibration Laboratories) certified for proving quality services and adherence to the technical competence. The centers at BookMyScans are audited periodically. BookMyScans help you book your appointments any time of the day at the centers nearest to you. You get high quality reports, and they can be accessed online and also downloaded.